The 3,260 hectare Belmont Research Station is located 32km north of Rockhampton on the Fitzroy River. It is owned by AgForce Queensland and managed by CSIRO Livestock Industries. 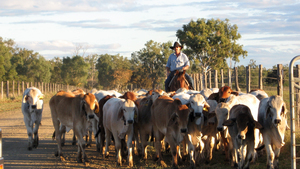 The station's research and breeding program officially began in 1953 to develop new tick-resistant cattle breeds to replace the British Hereford and Shorthorn cattle herds, which then dominated grazing in northern Australia. The program aimed to produce tick resistance by crossbreeding existing herds with newly introduced breeds of cattle derived from Africa's Zebu line - the American Brahman, and the Africander. The program was a major success and most Northern Australian cattle still exhibit some Zebu content. The program also produced a new cattle breed, the Belmont Red, which is proving useful in crossbreeding to increase herd fertility and meat quality, as well as tick resistance.